He’s the oldest manager in baseball, who just so happens to be the coolest dude in the game. He’s won more games than any active manager, but the only World Series he won was 36 years ago as a player. 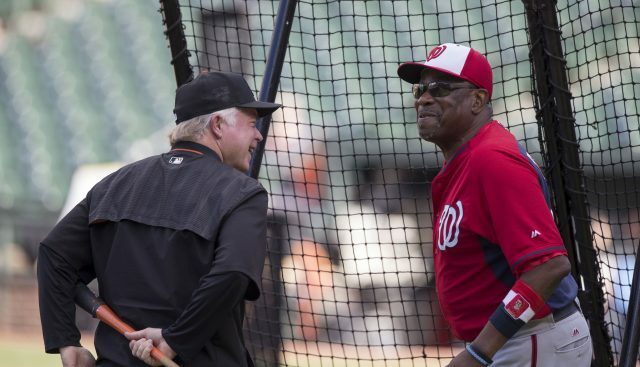 Now, with a toothpick in his mouth, and boulder-sized chip on his shoulder, Dusty Baker, the 68-year-old manager of the Washington Nationals, is embarking on a vengeance tour. It starts at 7:31 Friday (TBS), in the National League Division Series, when the Nationals play the Chicago Cubs, the team that fired him 11 years ago, and he never forgot. If the Nationals win the Division Series, and they should, the Los Angeles Dodgers or Arizona Diamondbacks will be his next targets. Even though Baker spent eight years as a player for the Dodgers, helping them to win three pennants and a World Series title, they bypassed him twice as a managerial candidate, instead hiring Don Mattingly and then Dave Roberts. The Diamondbacks had an opening two years ago, too, and GM Dave Stewart said he wanted to hire Baker. Stewart’s boss, Tony La Russa, refused to let him because of their managerial feud. And, if the Nationals get to the World Series, trying to win their first championship in the nation’s capital since 1924, the last piece would be the New York Yankees, the team that cost Baker two World Series rings, with the Dodgers losing to them twice before finally winning. This is the Disney-themed version of how Baker wants to crush the Cubs and Dodgers on his way to the World Series, and yes, to the Hall of Fame. Baker, who has won more games than any active manager, 14th on the all-time list with 1,863 victories, is one of only six managers who has led his team to nine postseasons, and one of just four who had at least 1,500 hits as a player, and 1,500 victories as a manager. That would put Baker in a pantheon with San Francisco’s Bruce Bochy and Cleveland’s Terry Francona as sure-fire Hall of Fame managers. It has been 24 years since an African-American manager has won the World Series, when Cito Gaston won back-to-back World Series title with the Toronto Blue Jays, and no African-American manager has ever been elected to the Hall of Fame. Baker plans to change all of that, and sitting in his office, listening to his passion and conviction, you can’t help but believe this is his time. “It would mean a lot to me, and my family and friends, to be the first African-American manager in there,’’ Baker tells USA TODAY Sports. “It wasn’t something I didn’t really think about until I got to Cincinnati, and (equipment manager) Rick Stowe kept reminding me of who I was passing on the all-time win list. “What matters most to me is just winning a championship. And to win one, you’ve got to have guys who perform, and you got to get lucky. It’s Baker’s strong religious faith that has kept him sane through some of the most torturous defeats in postseason play. Baker was five outs away from winning the World Series with the Giants in 2002 when their bullpen collapsed in Game 6 against the Los Angeles Angels. It was Steve Bartman and Alex Gonzalez who haunted him in Game 6 of the 2003 NLCS when he managed the Cubs. Cincinnati Reds ace Johnny Cueto got hurt in the 2012 NL Division Series when they blew a 2-0 lead to the Giants. Stephen Strasburg and catcher Wilson Ramos missed last year’s postseason when they lost in Game 5 of the Division Series to the Dodgers. It’s his faith why he also believes now is his time. Sure, his ace Max Scherzer, won’t pitch until Game 3. His best player, Bryce Harper, has played only five games since Aug. 12. Leadoff hitter Adam Eaton, has been gone since April 28. His full bullpen wasn’t assembled until July 31. Yet, the Nationals still won 97 games, winning the NL East by 20 games, and now are vying for their first playoff series victory in franchise history. Baker plans to win, and do it his way. He believes in his starting pitchers going deep into games, with the Nats’ starters throwing at least 115 pitches in a major-league leading 13 games. He creates his own lineups, not ones that come from the front office. He used analytics before the phrase even entered baseball’s lexicon, but trusts his heart and instincts more. When Baker led the Giants to three playoffs berths and a National League pennant, it took them seven years to return to the postseason after his departure. He was fired from the Cubs after the 2006 season, and it took them four years to get back to the playoffs. The Red went to the postseason three times in four years, and they still haven’t been back since Baker was let go.